Beat to quarters! Clear for action! Trim to battle sails! Run out the big guns! Arrgghh, Matey! There's an Enemy in Sight, broadsides to be fired, prizes to be taken and fun to be had in this exciting card game of chance and skill depicting the age of fighting sail. John Paul Jones and Lord Nelson sail the seas again on your gaming table in this easy-to-learn card game. Take command of your squadron, size up your opponents, pull alongside and board through the smoke. Watch that weather gauge as you take your prizes to port. The constantly evolving naval battle will challenge skill, demanding your audacious best. 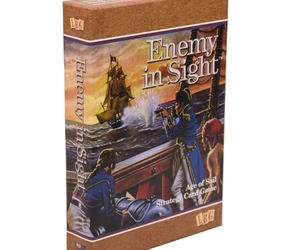 Enemy in Sight is suitable for 2 to 6 players and takes one to two hours to play. Awesome game, and an awesome price! The artwork is great, the chits are high quality: I think they're wood. I have a lot of fun playing this game, and it's affordable! Good job LBG!